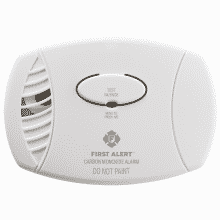 The First Alert CO400 Carbon Monoxide Alarm utilizes a electrochemical carbon monoxide sensor that lasts for up to five years to detect carbon monoxide. This carbon monoxide detector is battery powered, making it portable and easy to use anywhere, even in the event of a power outage. When carbon monoxide levels become elevated, a loud 85-decibel alarm alerts you to the threat. 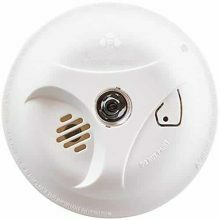 First Alert SADUAL Dual Sensor Smoke and Fire Alarm (Model SA320) utilizes both ionization and photoelectric smoke sensors for optimal performance – detects both fast flaming and slow smoldering fires. Smart sensing technology helps recognize the difference between non-threatening conditions and real emergencies. Mute bottom serves purpose of quickly silencing alarm and testing it’s function. Powered by 2-AA batteries (included) with EZ access battery door – allows you to change batteries without removing the alarm from the ceiling. Meets UL217 standards and backed by 10 year warranty. Guide your loved ones safely out of harm’s way with this First Alert Escape Light smoke and fire alarm. Onboard illumination shows the path out if the worst happens, and an ionization sensor picks up the earliest signs of flames. The easy-access door on this First Alert Escape Light smoke and fire alarm makes maintenance easy. 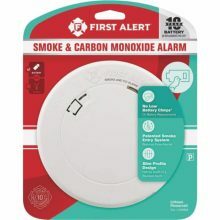 The First Alert PRC710 Slim Photoelectric Smoke and Carbon Monoxide Combo Alarm with 10-Year Battery helps protect your home from 2 potentially deadly threats by providing up to a decade of uninterrupted monitoring. 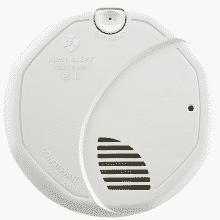 Equipped with dual sensors, this low-profile alarm detects smoke from slow-burning, smoldering fires and elevated carbon monoxide levels. This detector has a slim, contemporary design that mounts unobtrusively on a wall or ceiling. A built-in 10-year Li-Ion battery provides continuous power, with no need to ever worry about changing the battery during the lifetime of the alarm.